Summary: Josef is a Jewish refugee from Germany headed to Cuba in 1939. Isabel is leaving Cuba for Miami in 1994. Mahmoud is fleeing Syria and heading for Germany in 2015. All three of these children face enormous obstacles as they travel with their families across sea and land to try to find new homes where they will have peace and security. Their stories are told in alternating chapters, with a cliffhanger at the end of each one. All three stories tie together at the end. Maps of each of the journeys are shown at the end, and a lengthy author’s note tells about the historical facts behind each tale. There’s also a “What You Can Do” section, encouraging kids to donate money to UNICEF or Save the Children. 352 pages; grades 5-8. 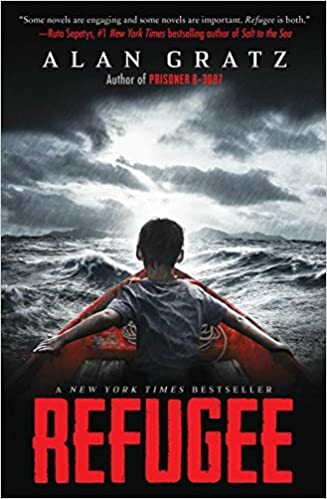 Pros: Fans of the I Survived series will find this book irresistible, with the exciting storylines and courageous kids finding their way in an unimaginably frightening world. Cons: Occasional language and a graphic concentration camp description may make this better suited for middle school than elementary.